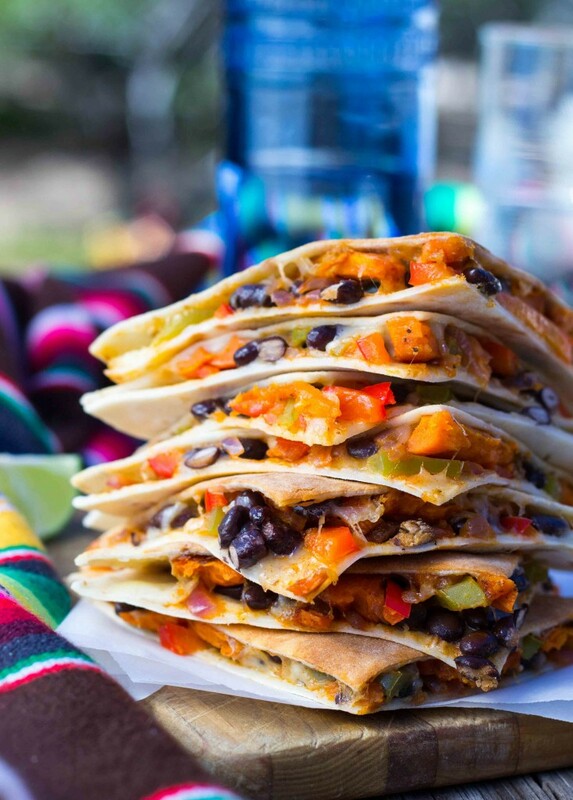 Sweet potatoes and black beans combine in gluten-free quesadillas with a twist. Preheat the oven to 400° F. Peel the sweet potato, cut it in half, widthwise, and then cut each half into thin sticks. Place sweet potato pieces on a large cookie sheet and drizzle with 2 teaspoons olive oil and season with ½ teaspoon cumin, ½ teaspoon paprika, ¼ teaspoon smoked paprika, ¼ teaspoon garlic powder, ¼ teaspoon salt and ¹⁄8 teaspoon pepper. Toss to coat and bake until cooked through, turning once, 25-30 minutes. While sweet potatoes are roasting, heat a large pan over medium heat and coat the bottom with 2 teaspoons olive oil. Add the green pepper, red pepper, onion, and ½ teaspoon cumin, ½ teaspoon paprika, ¼ teaspoon garlic powder, ¼ teaspoon salt, and ¹⁄8 teaspoon pepper. Cook until vegetables are tender and beginning to caramelize, 15 minutes. Heat another large pan over medium heat and spray with cooking spray before adding each tortilla. Place 1 tortilla in the pan and evenly sprinkle with ½ cup of shredded cheese. Top with ¼ of the roasted sweet potatoes and fajita mixture, and 3-4 tablespoons of black beans. Top with another tortilla and cook until cheese is melted and both tortillas are browned, flipping once, for 7 minutes. Cut into wedges and serve. Nutrition analysis: 740 cal, 32 g fat, 60 mg chol, 1650 mg sodium, 79 g carbs, 16 g fiber, 12 g sugar, 30 g protein. Isadora Lassance lives in Tucson, Arizona, with her husband and their orange cat, Cheeto. She blogs shelikesfood.com, a mostly gluten-free food blog that celebrates whole food and seasonal ingredients.